Shri Brahmananda Sarasvati, originally from Uttar Pradesh, North India, had an extensive background in Eastern and Western medicine. He practiced medicine as Dr. Ramamurti Mishra for many years in India and the USA until he took sannyas (renunciation) and became Shri Brahmananda Sarasvati. His guru was Bhagavad Das, whom he met in Bombay India. In 1958, he founded the Yoga Society of New York. Ananda Ashram, which he founded in 1964 in Monroe, New York, continues to be devoted to Shri Brahmananda Sarasvati’s teachings and message. A Sanskrit scholar, his life was dedicated to the union of science and the spirit. 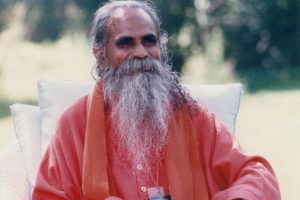 He is the author of Fundamentals of Yoga, The Textbook of Yoga Psychology (the definitive translation of Patanjali’s Yoga Sutra) and Self Analysis and Self Knowledge, along with many essays. Shri Brahmananda Sarasvati’s perennial teaching, “You are not the body and mind, although you have a body and mind,” along with the importance of meditation, the study of Sanskrit, and the practice of nada yoga—tuning the mind so as to align with celestial, cosmic musical vibrations—has had a significant influence the development of Jivamukti Yoga. Shri Brahmananda Sarasvati is the author of the seminal book on yoga, The Fundamentals of Yoga.